The review is based on findings of a TMR report, titled “Manganese Carbonate Market - Global Industry Analysis, Size, Share, Growth, Trends and Forecast 2015 – 2023.” By revenue, the global manganese carbonate market stood at US$322.2 mn in 2014. Exhibiting a CAGR of 4.2% between 2015 and 2023, the market is expected to reach US$464.1 mn by the end of 2023. Based on volume, the agrochemicals segment reported the highest demand for manganese carbonate in 2014. The segment held over 68% of the manganese carbonate market in the year. Regionally, Asia Pacific dominated the global manganese carbonate market, holding a share of 75.5% in terms of volume in 2014. The rising use of manganese carbonate as an essential agriculture micronutrient will considerably fuel their sales. This chemical is often added to plant fertilizers as a treatment for crops with manganese-deficiency. Agricultural sector still holds dominance across several emerging economies in Asia Pacific and Latin America. Hence, these regions are projected to provide lucrative opportunities for manganese carbonate manufacturers, as they exhibit high demand for micronutrient fertilizers. “Since, manganese carbonate is used as a colorant in ceramics and porcelain products, their increasing use in the homeware industry will fuel demand from the manganese carbonate market,” observed the author of the TMR study. The homeware market witnesses lucrative opportunities in Asia Pacific and the Middle East and Africa. Demand for porcelain and ceramics is thus high across these regions, which translates into increased opportunities for manganese carbonate sales. One of the key factors favoring growth of the manganese carbonate market in emerging regions such as Latin America, Africa, and Asia Pacific is that a majority of manganese reserves are concentrated in these regions. However, “Region-specific concentration of manganese reserves have resulted in lesser global opportunities for manufacturers,” states the TMR analyst. This limits the market’s expansion in developed economies. Furthermore, the majority of manufacturers have signed agreements with mining companies located in close vicinity. This in turn hinders the entry of new players in the market in the absence of favorable agreements. Nevertheless, the potential applications of manganese carbonate in concrete staining will boost its sales in the near future. Concrete staining is slowly emerging as popular technique to create decorate, durable, and easy to maintain home surfaces. The rising use of manganese carbonate to stain concrete surfaces will bolster its sales opportunities in the forthcoming years. The global manganese carbonate market currently demonstrates the presence of numerous small and medium-scale companies. As per a new Transparency Market Research (TMR) report, intense competition exists among these enterprises engaged in the manufacturing different grades of manganese carbonate. In order to gain a stronger hold in the market, companies such as American Elements, Alfa Aesar, Zncus Chemical Co., Ltd., and GFS Chemicals, Inc. are investing in the research and development of novel grades of manganese carbonate. These companies are working closely with consumers to develop products that cater to their dynamic preferences. Besides these, the leading companies in the market are also looking to expand their production capacities by capitalizing on untapped opportunities in emerging markets. Due to the prevalence of these factors, the degree of competition in the market is expected to remain high through the forecast period from 2015 to 2023. Rising use of manganese carbonate as a micronutrient in agriculture to keep revenue growth steady. Accounting for 68% of the market in 2014, agrochemicals segment exhibited highest demand for manganese carbonate. 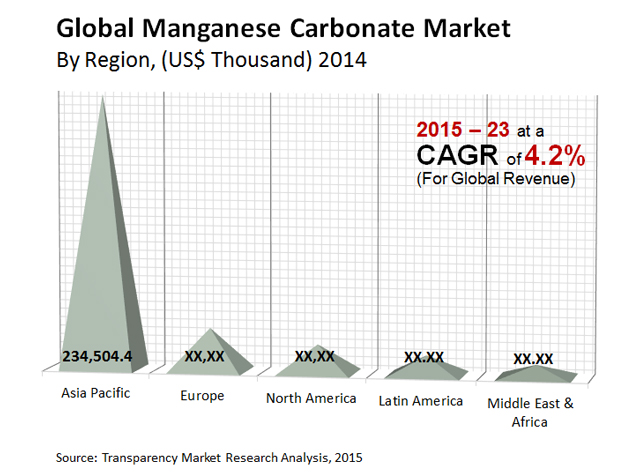 Asia Pacific accounted for 75.5% of global demand for manganese carbonate in 2014.